Tell me who your least favorite inner Senshi is and why so, try to be as specific as you can. Also, try to avoid saying stuff like "She's not as good looking", I would like to know you opinion personality wise. You can base it out of any SM media you want, but I'd prefer have you stick with either with the 90's anime or manga, since they are the only ones I've watched (read) properly. I honestly don't have a least favorite one. I pretty much like all of the Inners and even the Outers in different ways. Really the only Senshi I tend to have more negative opinions about are the Starlights but I don't really hate them either I more or less resent them. Yeah, I don't dislike any of the senshi, though there are some whose personalities I find irksome at times. I guess my "least favorite" of the Inner Senshi would be Rei, simply because I find her bitchy attitude overbearing at times. I am talking about the '90s anime, by the way. Sailor Moon. She is always watching while the others do all the hard work, so she can throw her ballet dance to gloriously finish the enemy. Which is not to say that I dislike Ami. I actually like her very much. But out of all of the Inners...I guess I just like Rei, Minako, and Makoto a lot more. I like that Ami is intelligent and has power over water (my favorite element), but I much prefer Rei's temperament (in the 90s anime especially), Minako's mixture of seriousness and hilarity, and Makoto's general character. Ami seems a bit like a stereotype for a nerdy character in many ways and I just wish she had some more self-confidence. "All I have is studying," she says -- but wait, she's also really good at chess, and she loves to swim, and oh yeah by the way also has superpowers and can essentially be reborn over and over again thanks to her Sailor Crystal. But yeah, all you have is studying...sure. That came out kinda mean. I actually do like Ami, it's just that the other three are more interesting to me personally. I am talking about the '90s anime, by the way. Isn't that a little unfair towards her, but I guess YOU ARE right. By the way, Moon isn't really a part of the inners (? ), correct me if I'm wrong, she might be. I love all five of them, but if I were to choose who is my least favorite, I would have to say it's Ami/Mercury. She can get too focused with her studies which makes her kind of uptight and she can be somewhat of a party pooper by reminding her Inner friends that they still have to study when they are about to throw a party. @Ale6 Moon is considered one of the Inners (by a majority of fans), though she's not a planetary Senshi. Not counting Moon and Chibi Moon as Inners for this. Maybe he's following the manga definition of the term? I still like Ami, despite her being the teacher's pet and an uptight killjoy at occasional festivities. It's pretty hard to think that someone might not actually enjoy these characters. They are so lovable. I do love all five of them. I once rambled up a big list where I managed to prioritize most-to-least favorite characters for the entire recurring cast (for the '90s anime versions), and I think the Inner Senshi all made the top 15 (but none of them made the top 5, because they don't jump in front of Moon Tiaras, have swirly glasses, hop over tennis fences with their hands in their pockets, ally with rats, or have happyface glowglasses). But I'm having a hard time remembering who placed lowest of the five! I think it was Mars even though she's awesome?? Usagi can be grating on occasion, and might not always carry every single episode (some SuperS episodes come to mind), but when she shines she REALLY shines! Every season finale comes to mind, as do several other fun or memorable occasions. Ami might seem dull or one note about the studying, but she's got that weird maniacal fervor lurking beneath the surface that makes her stand on Nephrite's car or smash the DD Girls' holoprojector with her computer, or that whole thing with 'Mercurius'. Rei also doesn't get enough chances to shine, but she's got that fantastic friendship/nagging/sisterliness/blushiness (see episode ) with Usagi, and carries plenty of good episodes herself. Makoto doesn't get that many great focus episodes but she's tough (yet soft but not in any bad way), and pretty much beat up Youma Gesen before even finding out she was Sailor Jupiter, so... yeah. Minako doesn't get a lot of good focus time or satisfying conclusions, but she's sympathetic in how kind of sucky that is, and she's also hilarious. It's really hard to actually pick one. Let's just pretend they have to have a big funny fight about drawing straws. or the Starlights (Seiya doesn't know when to take no for an answer but he's not so bad otherwise, and the other two are okay too). Pegasus and Rubeus, however, get to hang out at the bottom of my list. I don't hate them, but Pegasus was quite frustrating in his one-sided demands for secrecy and trust, and Rubeus was one of the few miniboss characters to never come off as sympathetic or funny, just kind of a jerk (for some reason I give Jadeite a lot more of a pass the same basic problem, because at least he had that interesting thing with Thetis, and episode 44 gives him a retroactive sympathetic origin regarding the brainwashing... plus he seems like the kind of guy who's focused on his duty very seriously and stiffly to the exclusion of all else, whereas Rubeus seemed kinda sloppy and lazy and pointlessly mean). Hmm if I have to be honest I would say Minako. I mean in the past for me my least favorite was Rei I only thought of her as she is in the early episodes where she is always bullying Usagi but once they get over their inital rivalry I didn't dislike her anymore they both matured a lot and Rei became really protective of her and considerate of her feelings. I just don't really like Minako as much because she isn't that distinct a character in the anime they could give just about any of her storylines to another senshi and it wouldn't matter. I feel like Minako's characterization is inconsistent in the anime as well she came off as a lot more mature and intelligent in earlier episodes and then became much ditzier. I enjoyed the minako of the earlier episodes a lot more she was as strong leader type but I found her pretty obnoxious later on. I have to say the voice acting in the dubs makes a huge difference though I think Emilie Barlow made her character sound a lot more annoying than Stephanie Morgenstern or Cherami Leigh did. I like all of them, but Mars has to be my least favorite of the Inner bunch. She can be a little too hot-headed and mean at times, but her passion makes up for that. 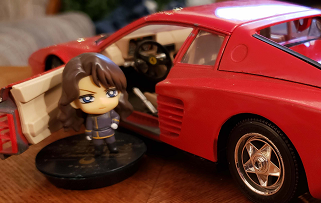 I can't help but remember SMA Nephrite: "Why the [HONK] are you standing on my car!? There's street all around you, why stand on my car!?"